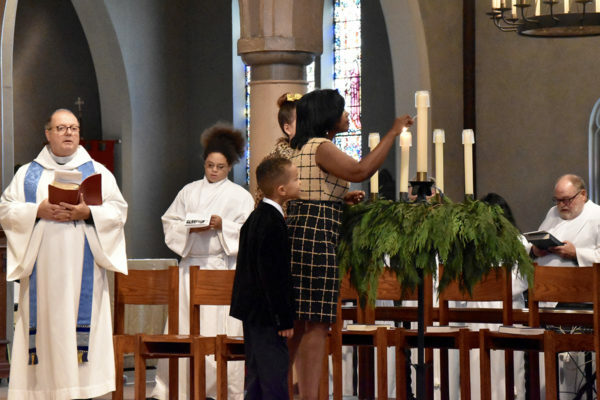 [Episcopal News Service] Episcopalians have spent the past five months taking up the Way of Love’s seven practices, with help from a wide range of liturgical and devotional tools from all corners of the Episcopal Church, and the church is encouraging all to make a special effort to embrace this rule of life during Advent. The church has released Journeying the Way of Love, featuring both a four-week Advent curriculum and an Advent calendar. Both are tied to the readings and themes from the first two chapters of the Gospel of Luke. A rule of life is a set of simple spiritual practices intended to focus believers on their faith journeys and provide support along the way. The Way of Love framework is built around seven practices, which for the Advent curriculum, are scheduled on specific days of the week: worship (Sunday), go (Monday), learn (Tuesday), pray (Wednesday), bless (Thursday), turn (Friday) and rest (Saturday). The Advent calendar follows a similar pattern. Presiding Bishop Michael Curry unveiled the Way of Love in July at the 79th General Convention. Since then, the church has joined with numerous affiliated organizations to develop and promote additional resources to help people bring Jesus to the center of their lives. Some have been adapted for Advent, and Episcopalians are participating in other Advent initiatives in the spirit of the Way of Love. One prominent example is AdventWord, billed as a “global Advent calendar” that is populated each day by participants’ social media posts prompted by the day’s word and hashtag. AdventWord also will send a daily email during Advent with a reflection on that day’s word. The sign-up is here. Preparing to Become Beloved Community is an Advent curriculum focusing on racial reconciliation. A compilation of sermons for Advent and Christmas is available here. Episcopal Relief & Development offers an Advent toolkit. Church Publishing has Advent resources here, and additional seasonal items can be found here from Forward Movement. Church leaders expect to use the Way of Love as the primary framework for future seasonal resources, though innovations on these themes have transcended the liturgical calendar and inspired activity at the diocesan and congregational levels. The Diocese of Central Pennsylvania is promoting a Way of Love retreat on Dec. 14 and 15, part of the “Learning Weekend” series organized by the Stevenson School for Ministry. The agenda includes workshops intended to help clergy and lay leaders to incorporate the Way of Love in their congregations’ parish life.